Did you survive the Blog Hop? Wasn't it great? Thanks to everyone who came by and visited The Dies Have It yesterday. Remember - you can always visit that post and click on the links for the very talented blog hoppers. Today I am showing you another card that was almost complete before I added anything to it. I love the way My Mind's Eye puts their paper packs together. There are so many pieces of paper that just need a few embellishments to complete them. This is one of them. All I did was add 2 borders, three felt hearts and a few gems. The borders are both from MFT Stamps and the hearts are from Spellbinders. The sentiment stamp is from PaperTrey Ink. And in case you need any of these dies, I have linked them below for you. 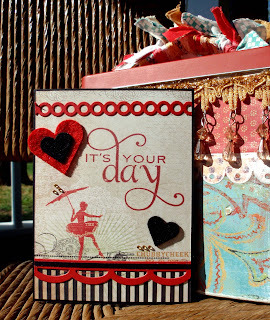 Tomorrow I will be showing you another card - one that is sweet and vintage and pink.